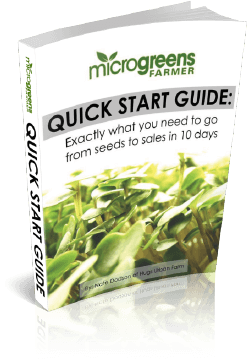 Launch Your Microgreens Business Today! Ever since graduating college I’ve been searching for a job with meaning that I could do at home with my loved ones. It’s people like you who have put out all this great info into the online world that has helped me transition into providing food for profit. I appreciate all the time you’ve spent in providing us with meaningful content. It gave me the courage to sign up for the farmers market and work less at my “normal” job. Get the fastest start possible growing and selling microgreens! Microgreens Farmer and Nate Dodson (“Company” or “We”) respects your privacy and is committed to protecting it through its compliance with this policy. This policy describes the types of information we may collect from you or that you may provide when you visit http://microgreensfarmer.com (including any content, functionality and services offered on or through such website, whether as a guest or a registered user), and our practices for collecting, using, maintaining, protecting and disclosing that information. As used herein, “Website” shall refer to the aforementioned website. You can review and change your personal information by logging into the Website and visiting your account profile page. You may also send us an e-mail at [email protected] to request access to, correct or delete any personal information that you have provided to us. We cannot delete your personal information except by also deleting your user account. We may not accommodate a request to change information if we believe the change would violate any law or legal requirement or cause the information to be incorrect. Our Website is not intended for children under 18 years of age. No one under age 18 may provide any information to or on the Website. We do not knowingly collect personal information from children under 18. If you are under 18, do not use or provide any information on this Website, make any purchases through the Website, use any of the interactive or public comment features of this Website or provide any information about yourself to us, including your name, address, telephone number, e-mail address or any screen name or user name you may use. If we learn we have collected or received personal information from a child under 18 without verification of parental consent, we will delete that information. If you believe we might have any information from or about a child under 18, please email [email protected].